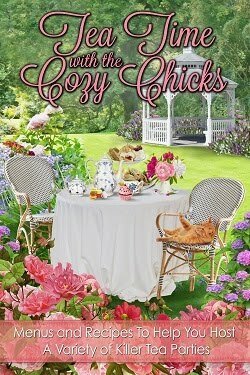 The Cozy Chicks are pleased to have the very talented Lucy Burdette visiting us! She's talking about cozy mysteries--and we all know how much we enjoy those. Cozy up, grab your cup of coffee (or tea) and read Lucy's theory on why these books are so popular. But be sure to tell us why YOU think cozies are so popular, too. When I had my first mystery published back in 2002 (Six Strokes Under, written as Roberta Isleib), cozies were doing fine, but certainly not threatening to clog the bestseller list. Now I’ve just published my tenth (DEATH IN FOUR COURSES) and it seems to me that cozies are experiencing a delightful resurgence. A bunch of my pals have hit the New York Times bestseller list (yay Denise Swanson! Julie Hyzy! Krista Davis! Sheila Connolly! Maggie Sefton! Lorraine Bartlett! Kate Collins! Leann Sweeney! Jenn McKinlay! Ellery Adams! )—and tons of new series are announced every month. Why does it feel like now everything is all cozy, all the time? I have a theory. The world is a scary place lately—really scary. The news is almost always bad coming out of the Middle East. Even our less “foreign” neighbors, the Europeans, are struggling. Closer to home than that in our own country, people find themselves in danger in their hometown movie theatres or their places of worship or in college classrooms. And so is it any wonder that readers want to get away to a simpler place and time, where the bad guys get what’s coming? Period? Of course, there are murders in cozy mysteries. But the damage is contained and the bad guys are punished and order is restored by intrepid amateur sleuths who help the law enforcement guys see what was right in front of them. And while all that is happening, readers are introduced to life in a small town and they get to meet the sleuth’s friends and neighbors along the way. All that said, the next time your stomach turns when you’re partway through a newspaper or the evening news or whatever, pick up a cozy. 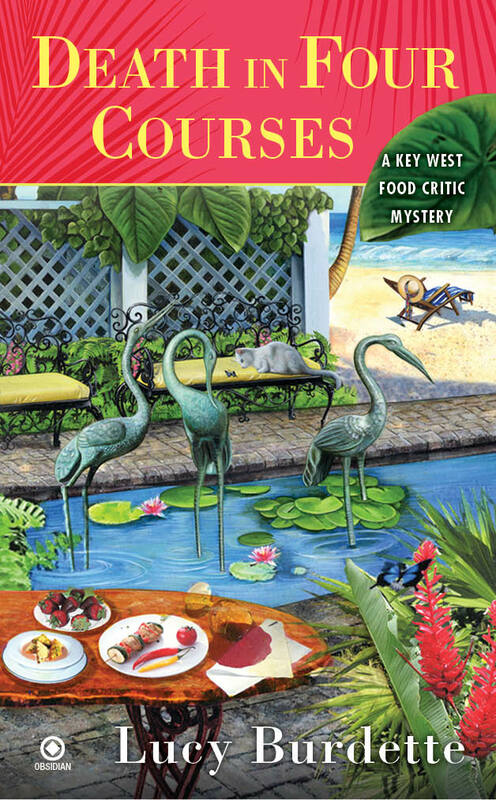 In the Key West food critic mysteries, I promise you no uncertain outcomes. And the food is divine. And you might just fall in love with funky, foodie Key West and Hayley Snow, the way I have. Which oh, by the way, is another way to keep your mind off current events—sign on to write a series of cozies! I swear you’ll start to think that new world you’ve created is real…. Lucy Burdette is the author of DEATH IN FOUR COURSES and AN APPETITE FOR MURDER published by NAL/Obsidian. You can read more about her food critic mysteries at her website (www.lucyburdette.com), or “like” her on facebook (www.facebook.com/lucyburdette), or follow her on Twitter (www.twitter.com/lucyburdette). She also blogs with the fine writers at Jungle Red Writers (www.jungleredwriters.com) and Mystery Lovers Kitchen (www.mysteryloverskitchen.com). I'm such a big fan of copies (obviously since that's all I review over at my blog). I love how popular they are now and I know I won't run out anytime soon. For me it's the gorgeous cozy towns and all the interesting characters. Love them! I so agree with you about the contrast between the cozy world and the real world. Give me the cozy world any day! I also love Cozies, always been a mystery fan and when I found these it was wonderful. Read every one that I can find. I love your Key West Mysteries by the way. I love cozies because you can armchair travel. I really like the ones with recipes. I grew up reading Nancy Drew, so went I found Cozy Mysteries it was like a Nancy Drew for adults! I love how popular they are too, Bella! There have always been terrific writers in the genre, but now we have flocks of them--heaven! Cheryl--love that description of what you get in a cozy! Hi Lucy! Great to see you here! I just wanted to say that I just read (for review) "Death in Four Courses" and I LOVED it. Congrats on a great book! I agree about cozies being a way to get away from the real world. I get so tired of the strife and hate that seems to be every where now. No one seems to have courtesy or manners anymore. I just love to read these books and I read a lot. I always have a cozy handy for when I get tired of the rougher mysteries and suspense stories I also read. First I have to say Thank You for the wonderful bookmarks the Cozy Chicks sent my way. 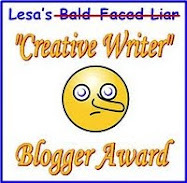 I was searching for a book by one of the chicks and found this blog. 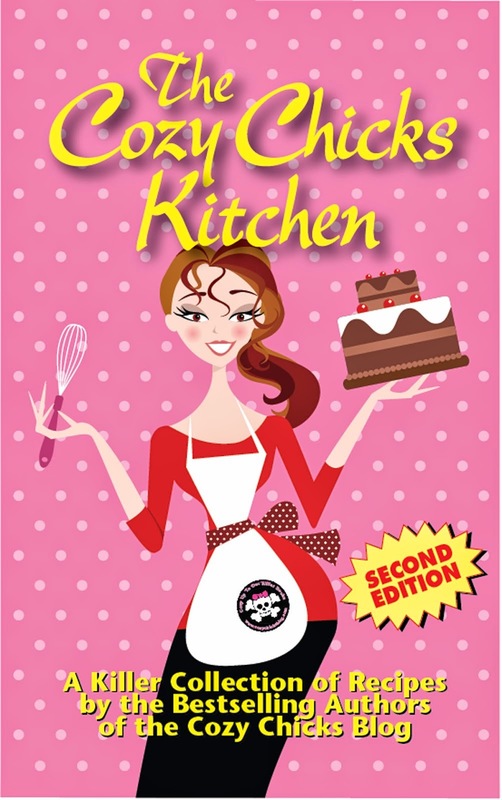 I have read at least one book from each of the chicks so I really belong here! I love cozies because I love mysteries and life is bad enough as it is so cozies make a great read because they don't get too graphic in detail (this includes the crime scene details and the bedroom steaminess). When I finish a cozy, I am left happy which is how I like to finish my day! I do like to read the other genres (thrillers, suspence, tear jerkers) but not as often as I read my cozies! BTW Lucy, I just finished "Appetite.." about a month ago, loved it and I am waiting to read "Four.". Looking forward to seeing more in the series. Lucy, thanks so much for being with us today! I love reading all these reasons people adore cozies--and agree with just about all of them. For me, I also love cozies because I love reading series and seeing characters grow... Can't wait to read Death in Four Courses. It's first up when I'm done with this deadline! Thanks so much Diane--hope you enjoy Death in Four Courses! I like an occasional thriller--I have Hank Phillippi Ryan and Randy Wayne White and CJ Box in my teetering pile--but not much at a time or I get nightmares. I love my cozies because they are exciting to read and guess along with the protagonist who is the killer. I also love how the author's develop their characters book after book after book and I never tire of them. Keep up the good work authors! The characters make the books--you're absolutely right Dru. The world we live in is indeed a very scary place. Plus some of us have health and family issues. For whatever reason, we all need to escape. I don't smake, drink, gamble or do drugs. I do love my coffee, my only addiction and of coarse reading. I read to relax and to escape the ugliness we see in the news every day. So thanks to all you wonderful cozy authors. You help make life easier for many of us. I love cozy mysteries, learning more about hobbies or shops and stuff. But I guess it are the characters that make me feel like coming home whenever I open up the next book in a series I love. And of course, I love most of the cozy covers. They are just tempting.